The Scrooby, Torworth And Ranskill Community Magazine. A monthly round-up of news and views from our three villages. 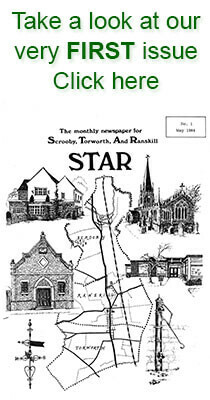 The STAR magazine is delivered free of charge and reaches all the residents of Scrooby, Torworth and Ranskill plus outlets in Blyth, Mattersey and Barnby Moor. Packed full of news articles and information about your local area plus loads of adverts so you can find out more about your local businesses. Read The Star to keep up with your local organisations such as your parish council, neighbourhood police teams, residents associations, schools, churches and more. Click here to download and read through the last 6 months issues of The Star. Discover who to contact at The Star. Editorial, Advertising, Distribution and Committee details. Find out how to reach more than 1,000 households in our distribution area. You'll find all our contact details in this section.